Magnum Systems has engineered, designed and manufactured quality pneumatic conveying and packaging equipment for the coffee industry for many years. The TE-10C is a variable speed vibratory scale feeder designed for weighments of 2 oz. to 5 lbs. Its success in the coffee industry is due to its dependability, with hundreds of units in operation. TE-10C small bagging scale works great with both ground coffee and whole bean coffee applications — capable of filling up to 12 bags per minute. Pneumatic conveying systems have been used to transferred coffee in some of the nation’s largest coffee plants. This expertise has been passed along to smaller coffee roasters and retailers, and today Magnum Systems provides safe and dependable pneumatic conveying systems to the entire coffee industry. 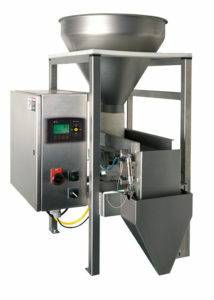 The Flexible Auger Conveyor is a simple, safe, and economical way of conveying coffee 4 ft. to 40 ft. It has the ability to handle green, roasted, whole, and ground coffee. Solution overview – Customer needed to overhaul their systems for a major expansion. This included a new network of green bean storage to roasters, conveying from roasters to either grinders or packaging, conveying of ground coffee to packaging, and removal of chaff from screeners to retrieval for other usages. The ground coffee was a particular challenge as it had already been screened and degradation was an issue. There was also limited headroom available due to existing processing going to a mechanical conveyor, so traditional dense phase pots would not work without major installation rework. Smoot provided low profile dense phase systems to fit in the current configuration while providing virtually no degradation. In addition, standard dilute phase systems were provided to convey roasted coffee up to 1,000 feet away into another building for processing. Project Scope – Package both whole bean and ground coffee into 12 oz, 2lb and 5lb bags. Equipment included TE-10C net-weigh vibratory feeders with pneumatic loading hoppers and band sealers. 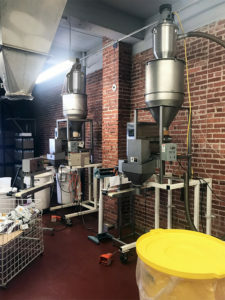 Solution Overview – Customer needed a versatile bagging system that could be easily operated and handle multiple types of coffee. The roasting facility had equipment on 2 different floors, the roasting process happened on the top floor. The second floor housed all of the bagging equipment. Once the coffee was roasted it was feed into work bins to prepare a batch for loading into the baggers. A vacuum suction loading hopper was provided to allow operators to easily fill the hoppers without handling the coffee or dumping by hand. Initially, only two bagging stations were purchased in 2006 and an additional coffee bagging station was provided in 2015 to keep up with growing demand. Click the link below to download the full project profile.